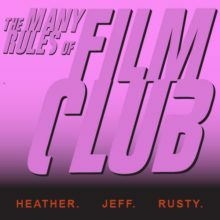 Jeff Yanc, Heather Lares, and Rusty Boulet-Stephenson host the Many Rules of Film Club. Film Club is a podcast dedicated to the art of the moving image. Generally we talk directors, and actors. So, Good movies, Great cinema, bad and comical disaster movies, it’s all on the table. We might talk television or the internet or the enjoyment of sitting in a theater. Most of all, we want you to think about movies you haven’t seen recently or maybe at all. Who are we? Jeff is the Program Director at the Loft Cinema. Heather is the Video Project Manager at the University of Arizona, and Rusty works as the Graphic Designer and Video Editor for Visit Tucson.